Why these two growing companies sat out of today's rally. 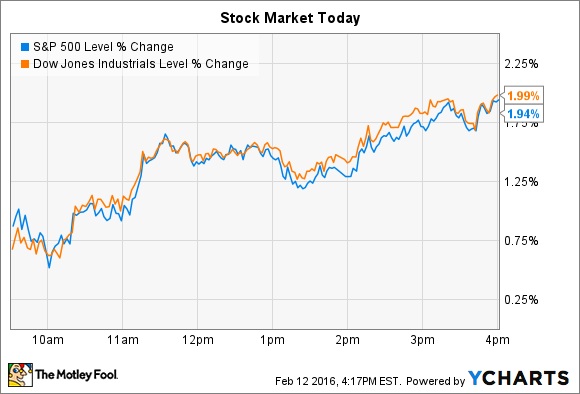 Stocks rose sharply today and the rally gained strength throughout the afternoon. Indexes ended at session highs and head into the long holiday weekend on the upswing. The Dow Jones Industrial Average (DJINDICES:^DJI) gained 311 points, or 2% and the S&P 500 (SNPINDEX:^GSPC) added 36 points, or 1.9%. In economic news, oil prices logged their biggest single-day spike in seven years, rising 12% off of their 13-year low reached yesterday. That bounce helped the energy sector lead the market higher today . As for individual stocks, Activision Blizzard (NASDAQ:ATVI) and Pandora (NYSE:P) didn't participate in today's rally, as they both sold off following disappointing fourth-quarterly reports. Activision Blizzard was one of the S&P's biggest decliners, falling 8% after posting its quarterly earnings results. Sales and profit growth beat management's expectations for the fourth straight quarter on strong execution across its gaming portfolio, but a few title launches failed to meet their targets . Destiny game screenshot. Source: Activision. Starting with the good news: The Call of Duty franchise ended 2015 at number one on the sales charts for the seventh straight year. Black Ops III also logged the highest number of active players in franchise history and the highest attach rate of digital content yet. Those strong engagement and digital sales trends were also true for Destiny, and they helped hold overall profitability steady even as currency swings hurt earnings. On the down side, Skylanders: Superchargers, Activision's latest installment in the toys-to-life franchise, didn't do as well as expected over the holidays. It appears that competition, including Disney's Infinity and Time Warner's Lego: Dimensions, finally caught up with Activision after years of basically having the kids segment all to itself. Looking ahead, the videogame publisher is on the cusp of a huge merger with King Digital (UNKNOWN:KING.DL) that will make it the largest game network in the world in just a few weeks, with 500 million engaged monthly players. That will add Candy Crush to Activision's large and growing list of industry-leading video game franchises. Pandora shares dove 12% lower today on heavy trading volume in the wake of its fourth-quarter report. The numbers were good, as revenue rose a healthy 25% to $336 million and beat Wall Street estimates, while earnings growth was right in line with expectations. The streaming radio company's sales outlook for the coming quarter also matched consensus targets. Yet two issues may have investors feeling less bullish on the stock. First, Pandora's active listener base is headed the wrong direction; it ticked down to 81.1 million users from 81.5 million last year. By comparison, Pandora added 1.5 million users, year-over-year, in the third quarter . And second, the company projected a big shift in profitability for the year ahead, saying it expects to book a loss of as much as $80 million after having generated over $50 million of profit in each of the last two years. Management is creating this red ink with spending initiatives aimed at taking advantage of what CEO Brian McAndrews called a "generational opportunity to drive the future of music for years – if not decades – to come." New initiatives to expand Pandora's reach in the global music marketplace could pay huge dividends, which is why executives are "confidently making the decision to invest now," he said.